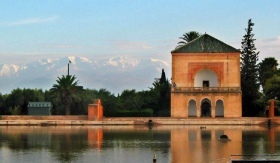 Our 4 days private Morocco tour from Marrakech starts today travelling over the Tizi n'Tichka mountain pass and we will enjoy beautiful views of the High Atlas mountains. We pass few Berber villages on the way to the World heritage site of Ait Benhaddou. This kasbah was used as a backdrop for many famous movies. After breakfast our private Morocco tour continues a and we depart to the Todra Gorge which rising to 300 m in a narrow valley. After lunch in the gorge, we will travel towards Erfoud and we may visit here fossil factories , then we head to Rissani to visit local souk. After that we reach the Sahara desert in Merzouga. From here we will ride camels into the beautiful Sahara desert dunes and we will spend this night in desert tents. 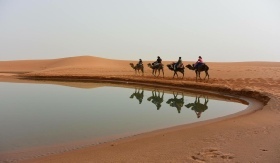 Today we continue private Morocco tour and we ride camels back to Merzouga. From here we drive through Draa valley to reach Ouarzazatte where we will visit Kasbah Taourirt which belonged to the Glaoui family, the Pashas of Marrakesh. Then we head to nearby Kasbah Ait ben Haddou, the most famous Kasbah in Morocco and a UNESCO World Heritage site. This kasbah is also well-known as the backdrop to many famous Hollywood movies. From here we drive back to Ouarzazatte where we stay overnight in local riad. 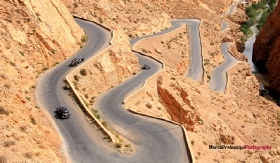 On our last day of our private Morocco tour we travel over the Tizi n'Tichka pass at 2260m. We will enjoy amazing mountain views at the Atlas mountains. This will be end of our 4 days private Morocco tour from Marrakech to Merzouga desert.